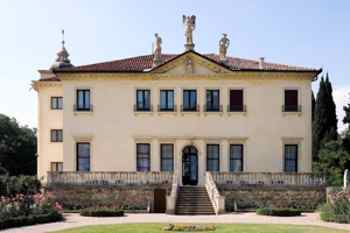 Another of the countless charming villas of Veneto, it is located in the eastern outskirts of Vicenza, not far from the celebre La Rotonda villa. Nowadays the complex is still inhabited by the family Valmarana, whose ancestors bought the villa in the first half of 1700s’, afterwards adding the guest-house and the stables. The complex comprises 3 buildings: manor house, guest-house and stables. 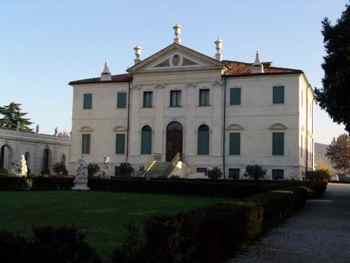 The manor villa in 1669 was the first part of the complex to be built, commissioned by Gian Maria Bertolo, a nobleman from Vicenza. He chose this enchanting hill as a meditation and getaway place. Currently we do not know the name of the architect though. Noteworthy are both the frescoes cycle inside 5 halls in the manor house, and the ones in the guest-house, made by the famous venetian painter Tiepolo. The German writer Goethe, during his journey to Italy, in 1786 visited the villa, and was stunned by the cycle of frescos, today considered one of the jewels of the 1700s’ italian painting. 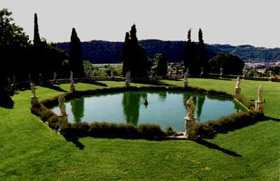 After visiting the interior of the villa, take your time and stroll around the majestic park, immersed in green and overlooking the rolling and lush Berici hills. The meaning of the last part of the villa - Nani- in italian means dwarfs. This name comes from the 17 statues of dwarfs placed all around upon the villa’s perimeter wall. The statues gave origin to a sad legend: a dwarf princess lived secluded in the pre-existent castle, along with her 17 dwarf servants, hired by her father to help her feel less different from the rest of the world, and forget her handicap. One day she saw a handsome prince walking in the romantic garden surrounding the castle and realizing her disability, she throw herself down the tower in despair. The dwarfs literally petrified with grief for eternity. A curiosity: the american movie director Joseph Losey, beside the other villa La Rotonda, shot just here some scenes of his 1979 movie titled Don Giovanni inspired by the Mozart’s opera. 10am to 12am and 2.30pm to 5pm. Tuesday to Sunday (closed on Mondays)10am to 12am and 3pm to 6pm. It is also possible to visit the Villa outside the set time upon the payment of a supplement. Please phone before. Free access to children under 12. This is one of the most suggestive ancient villas in Veneto, built upon a hill in the small town of Trissino, surrounded by a spectacular natural setting. Be prepared to enter heaven, before walking across the gate along the evocating lemons alley. You will be soon enthralled by an immense 20 hectare/50 acres property, embellished with a scenic park. Just relax and feast your eyes on the surrounding landscape, embraced by centuries old trees, native and exotic plants, and enjoy the view of two wonderful Italian style gardens, surrounded by a lush landscaped park. The mansion is actually made up of two different buildings, the upper villa an the lower one, both placed in the spectacular park, all enhanced by large panoramic terraces offering stunning views, filled - like in many villas of Veneto - with over a hundred marble statues of Orazio Marinali, the most famous Veneto’s statues maker of the 1600-1700. The first core of the villa was built in the 1400’s by the noble family Trissino, over the ruins of a Middle Ages castle owned by the family itself. The villa is available for concerts, parties, meetings, exhibitions and educational activities for schoolchildren. This amazing 1700’s villa, built after the designs of architect Giorgio Massari, lies in the Vicenza’s plain between Lessini hills and Berici hills, in a village called Montecchio Maggiore, 8Km/5miles west of Vicenza. Its structure is clearly inspired by the style of Palladian architecture, that often uses columns to recall antiquity. As common in many ancient villas in Veneto, beside the manor house you will also see two lateral buildings, serving as guest house and stables. In one of the interior halls, you can admire some fine Tiepolo’s frescoes. Enjoy its magnificent park embellished with hedges, ancient statues and decorated vases. 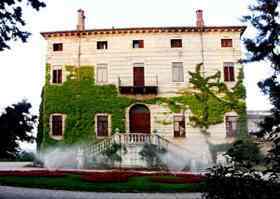 Nowadays the villa is owned by the Vicenza Province administration. free for children under 10, compulsory schooling kids and their teachers,over 70, persons with a disability. To book for groups: ph. 0444 908112.